This does not look much like the common cultivated kinds of Barberry, for it grows close to the ground in a straggling bunch. In favorable situations it is a handsome and conspicuous plant. 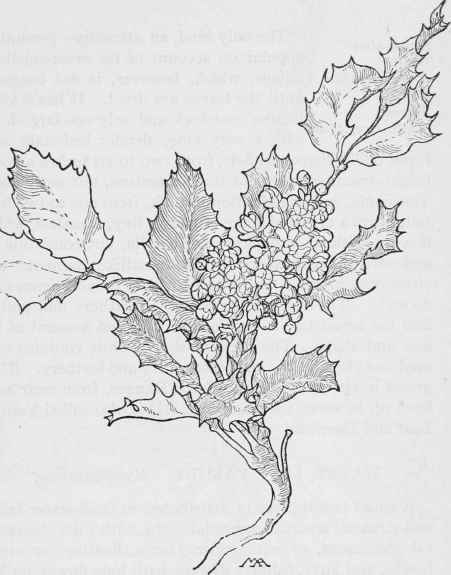 The leaves, with from three to seven leaflets, are stiff, prickly, and evergreen like Holly, and the yellow flowers are in clusters at the ends of the stems, with opposite bracts. The six sepals, petals, and stamens are all opposite, that is, with a petal in front of each sepal and a stamen in front of each petal. In Arizona the flowers are rather small and the clusters short, but in Utah they are far handsomer, rich golden-yellow and sweet-scented, forming clusters two inches long. The fruit is a handsome blue berry with a "bloom," the color of wild grapes, contrasting well with the foliage when it turns red in the autumn, and delicious jelly is made from them. B. aquifblium, of Oregon and Washington, is similar, with much more beautiful, very shining leaves. B. Fendleri, of the Southwest, is from three to six feet high, the branches smooth and shiny as if varnished, the leaves with smooth edges or spiny teeth, and the flowers in numerous drooping clusters. The calyx has conspicuous, red bracts and the berry is red. Oregon Grape Berberis repens. WATER LILY FAMILY. Nymphaeaceae.